The Fitness Mad 4Kg PVC medicine ball is a very practical tool for gym and fitness sessions and is ideal for working your whole body at a higher level of intensity. Strengthen your arms, abs, legs and lots of other muscle groups on this very effective, 4kg (8.8lbs) weighted medicine ball. Whatever sport you’re into, or if you’re just looking to improve your fitness or take exercise sessions up a notch, this top fitness accessory is sure to help. Work out with a full range of motion doing a wide variety of exercises thanks to this water-resistant PVC ball which is easy to grip and bounces. for submitting product information about Fitness Mad 4Kg PVC Medicine Ball We aim to answer all questions within 2-3 days. 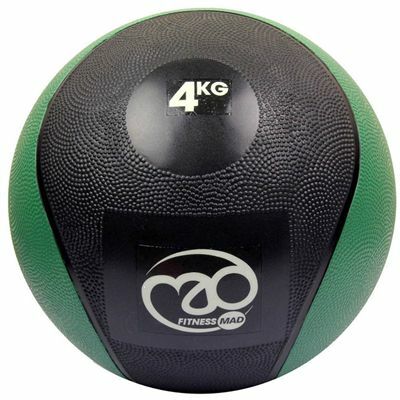 for submitting product information about Fitness Mad 4Kg PVC Medicine Ball. We aim to answer all questions within 2-3 days. If you provided your name and email address, we will email you as soon as the answer is published. for submitting product review about Fitness Mad 4Kg PVC Medicine Ball.